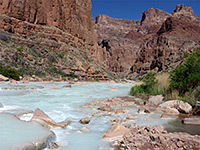 Despite its name, the Little Colorado River is one of the largest tributaries of the Grand Canyon, forming a dramatic narrow gorge that stays deep and enclosed for 45 miles across the flat plains of the Painted Desert in the Navajo Indian Reservation, before becoming shallower as it approaches Cameron on US 89, so that when the highway crosses the river the cliffs are only 100 feet high and the canyon floor is wide and bushy. The cliffs recede completely a little way east, though the river extends a long distance further to its origin on the slopes of Mount Baldy near Springerville, on the way tumbling over a few cascades including 185 foot Grand Falls. These are visible for just three or four months each year, however, as the river flows only during spring and after summer monsoons; for the rest of the time the Little Colorado and its gorge are largely dry apart from the lowest 13 miles, downstream of Blue Spring. This powerful, year-round source produces large volumes of brilliant turquiose water, the unusual color being due to suspension of several minerals including calcium carbonate. 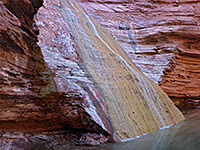 The color is diluted, or masked entirely if the river is flowing from further upstream, after rainfall. 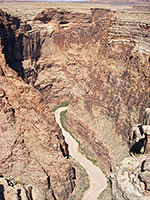 The deep part of the canyon can be seen in the distance from various viewpoints in Grand Canyon National Park (such as Cape Final and Naji Point), but easily accessible, close-up vantage points are limited to two overlooks of the upper gorge along AZ 64, the section between Cameron and the edge of the Coconino Plateau, where the canyon is around 800 feet deep and 800 feet wide. The more spectacular lower gorge is much harder to reach, requiring long drives across unpaved roads in the Navajo Reservation, followed by a difficult hike, however for those suitably prepared, a trip to this remote region is a great way to spend a few days. 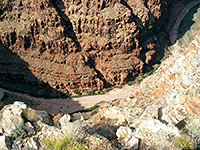 The main overlook of the upper Little Colorado River canyon is between mileposts 285 and 286 along AZ 64. Visitors walk from a parking area just off the road, past several rows of Navajo jewelry stands, to a railing-protected viewpoint on the edge of the gorge, from where about a quarter mile of the canyon is visible. A steep side ravine immediately east provides a route down, though this is not marked in any way. The second roadside viewpoint is 5 miles west, near milepost 281; this has a smaller parking area with fewer jewelry sellers in attendance. From here a half mile trail leads northwards to a promontory on the rim, over 1,000 feet above the river bed directly below, giving a slightly better perspective than the eastern overlook. Interpretive notices along the way have information about some of the local plants. Apart from the two official overlooks, the canyon comes close to the road at a few other places so can be reached by parking next to the highway and walking across the plateau. Perhaps the best location is a little west of the 281 mile overlook, where the river forms a tight S-shaped bend and begins to deepen rather more. A walk of a mile or so is enough for good views down into the gorge, before it curves round to the north, and further progress along the rim is hampered by several deepening side canyons. Although the land enclosing the canyon is flat and featureless, the ground breaks up near the edge into a series of whitish limestone terraces bearing cacti and spring wildflowers, though in general the rocks in this part of the gorge are fairly dull and uniform in color - gray/brown Coconino sandstone and the Toroweap Formation, lacking the many shades of red that make the Grand Canyon so photogenic. 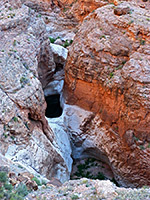 There are three principal tracks leading towards the much deeper lower canyon of the Little Colorado River. The roughest road, and the only one that reaches the southwest side, starts near the Desert View overlook in Grand Canyon National Park - the 4WD track descends steeply from the Coconino Plateau, past flat-topped Cedar Mountain then, after several junctions, ends at a point on the rim above Blue Spring, below where the river has a year-round flow. From here, the fairly well marked Blue Spring Trail descends to the canyon floor over a distance of about 3 miles. In contrast to the uneven surroundings to the southwest, the Navajo Reservation land on the northeast side of the river is mostly smooth and level, crossed by a complex network of unsignposted tracks (see map), some of which lead to the canyon rim after a drive of between 15 and 30 miles from US 89. Three of the more well used roads, generally fine for all vehicles, start at mile 482.2, near the US 160 junction (route 6135), a short distance further north at 487.4 (route 6134), and just north of The Gap (route 6130). 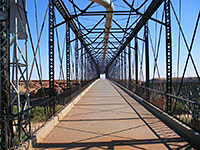 These can be used to access at least four trails (or cross-country routes) into the Little Colorado River gorge; one down a side ravine joining just north of Waterhole Canyon, another along Dry Wash, a rather longer tributary, and a third via the shorter but steeper Salt Trail Canyon. The fourth, most westerly, and hardest to reach is known as the Walter Powell Route, named after the great explorer who first traversed this area in the 19th century. This enables fit hikers to descend 3,200 feet over 4 miles to the confluence of the Colorado and Little Colorado rivers - a very scenic location, which is also reachable via the Beamer Trail.